Cesare Sabatino never intended to marry. But if his thoughts did ever stray in that direction, the lucky woman's answer would have been a resounding "yes". Imagine his surprise when Lizzie Whitaker turns him down on the spot! and discovers the many pleasurable benefits of wearing this tycoon's ring. Lynne Graham is a compelling storyteller. She always writes stories about people faced with unfortunate circumstances. How they tackle these unforeseen occurrences is what makes them stronger. The Billionaire's Bridal Bargain is one such story. Billionaire, Cesare is used to everything going his way. When his grandmother shows interest in an island that is meant to be poor girl Lizzy's inheritance-he is determined to do whatever it takes to gain access. Lizzy may be poor with the weight of the world on her shoulders but she is no pushover. Although she is in dire need of money, she is determined to do the right thing. What ensues is a battle of wills between two strong people. I have to say that although this was a good story, I expected more. I did not like the character of Cesare. There were times he came across deliberately cruel. 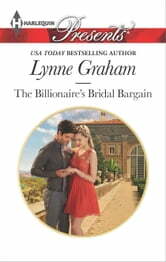 Although this story does not live up to the caliber of her earlier work, The Billionaire's Bridal Bargain is worth a look. Received an ARC of this story for an honest review.